Nemanja Vukovic, Danny O'Rourke and Josh Williams added a lot of fire and passion to the game yesterday. I watched with a friend of mine whose family is from Cleveland. Williams' hometown of Akron, Ohio immediately made him a favorite in my Brewery District abode. A couple months ago his name was, "Is That the Cleveland Guy." When Williams misplaced a header and furiously kicked the end line ad boards out of frustration I got an, "Is that the Cleveland guy?!" yup. "YEAH!!". When, (now) Josh was flinging himself at Houston wingers 35 yards away form goal? "YEAH! HE'S LIKE JOE HADEN!!" The 10,500 spectators on hand witnessed a fast paced and entertaining game that saw all 4 goals in the 2nd half. For the Crew it was Eddie Gaven's quality that saved the day. Two goals is just reward for his hard work. For Houston, it was Brian Ching and Will Bruin finding the back of the net. Both teams were playing positive MLS football. Passes were sharp and crisp and the players looked fresh. No doubt due, in part, to the more normal kick off time of 730 PM and cooler temps (very cool 40 ish degrees). Coach Warzycha continued line up tinkering saw both Nemanja Vukovic (LWB) and Josh Williams (CB) in the back four, replacing Eric Gehrig and Shaun Francis from the past two games. Danny O'Rourke was moved back to his more natural Defensive Mid / Stopper spot. All three of them contributed to a more open / attractive 1st half. O'Rourke, contributing the bulk of it. He replaced Kirk Urso who is more of a grinder (with a pretty free kick) right now. O'Rourke is an effective passer and can find space well. His tackling skills are tops in the league. While these things didn't translate into dangerous attacking play in the 1st half, they did show the kind of game Columbus can play (as in; not just hockey on a pitch). The nice play in the 1st half bore fruit in the 2nd. Both teams found themselves down by one looking to even it back up. Columbus went down 0-1 off a back of the head, pirouetting Will Bruin. Gaven then took things into his own hands scoring two times in 10 minutes, putting the Crew up 2-1. Just a few minutes later Bruin found Ching to even it up. It was the most exciting half of Crew soccer in some time. The best goal of the night was a team one. O'Rourke switched field with a pinpoint pass to Vukovic. He gathered and fired a bullseye pass to Schoenfeld who chested it down to Eddie for the left footed blast. • This draw ends the little two game losing skid the Crew were on. That said, 1 point out of the last three games is 3rd worst in MLS (only Toronto and Colorado worse). • Tony Tchani and Olman Vargas played decently but looked a step or two slow. Sometimes this can be a case of perception though. Perhaps lesser players wouldn't be anywhere near the ball in the first place. We'll see as time goes by. • Another quiet day from Mirosevic. I don't think it is a case of being an understated worker or contributor at this point. He needs to contribute to the Attack. Soonish. As in Now. • I'm in the minority, but disappointed not to see Bernardo Anor in the 18. He has / is outplaying both Tchani and Finlay. Finlay, in particular, lost his mojo. I see that spot falling this way: Anor, Duka, Tchani, Finlay. But, I'm weird I guess. 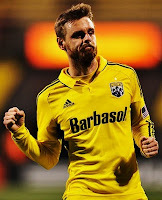 As it stands right now, Anor is the winningest player, per start on the team - and I like winning. • Williams and Marshall as the CBs is the future (it also matches my FIFA 12 line up). I think Warzycha should stick to that. It pushes Danny up and allows Eric Gehrig in relief behind him.